If you’re looking for a marketing tactic with the best ROI, look no further than email marketing. It may not be a new method, but it works. In fact, it’s considered the most effective way to engage and convert prospects into customers. This is because your audience has actively opted in to receive your emails, making it among the least intrusive marketing methods. But it’s also a great way to start offering personalized ad content to your audience. Thought this wasn’t possible? Think again! Link retargeting in email makes it easy for you to understand what matters to your customers. You can then start showing them relevant banner ads as they move on to browse the web. It often takes multiple interactions with your brand before a customer makes a purchase. A customer may come to your site several times and never actually buy anything. Retargeting makes it possible for you to stay top of mind with your customer once they leave your site. After all, you know they were interested in your brand at some point. Your ads will remind them of that as they consider different options or delay their purchase to a later stage. This achieved by placing “cookies,” or small data files, on your customers’ devices. These data files recognize when they’ve visited your site. Then, when your customers leave your site, your banner ads will start to appear as they continue to browse the web. Essentially, you get a second chance to convert your audience while you enjoy a click-through rate that’s often as much as 10 times higher than average. Additionally, most web mail programs, such as Gmail, block the cookie process. The result is difficulty serving personalized ads to consumers, and that’s where link retargeting comes in. Link retargeting takes retargeting to new heights – by bypassing the need to rely on website visits altogether. Instead, readers are “cookied” as soon as they click on a link you’ve shared (a specialized retargeting link). Spoiler alert: that link can be nuzzled comfortably right within your email campaigns! This means you can share multiple articles or links within email. For anyone who is interested in those topics and clicks on the links, you can start to show them relevant banner ads as they go on to surf the web. For example, Pampers has a massive database of readers that receive their newsletters. Even within the “new mom” category, they likely have “expecting mothers,” “new mothers,” “mothers with one-year-olds,” and that’s just to name a few. Pampers also has multiple products that are relevant to each of these subgroups. But how does the brand know who is who? An expectant mom won’t want to read about baby-proofing her home. And a mom with a two-year-old won’t want to read about diapers for newborns. Enter link retargeting. 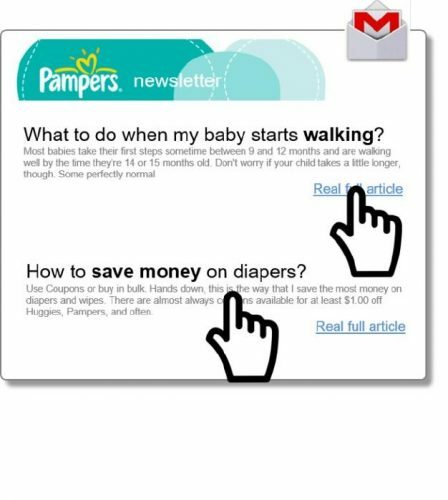 Pampers can easily implement link retargeting in their email marketing campaigns to better segment its audience by including specialized links for each of the different articles in their mailers. 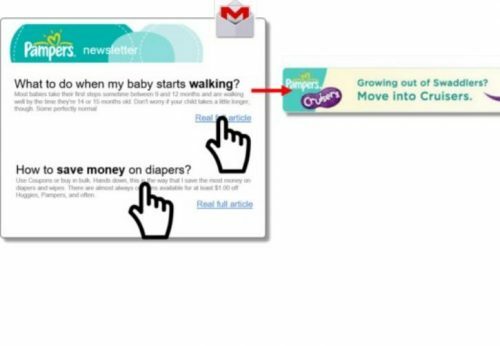 Pampers can use retargeting links to identify what matters most to readers. Then, once a reader clicks on a link, they’ll be “cookied.” Pampers can then show them tailored ads based on what matters most to them. For example, Pampers is able to show a Pampers Cruisers ad to moms who click on the article about babies learning to walk, as these diapers are meant for babies who are becoming mobile. 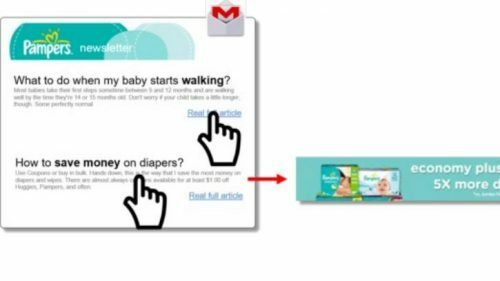 Pampers uses link retargeting to show Cruisers ads to moms who have shown an interest in content about babies that are ready to walk. On the other hand, Pampers can use a specialized link to an article about saving money on diapers. Readers who click the link would see Pampers ads that focus on what a good deal its economy packs are. Allowing the audience to self-select is an easy way to identify what consumers care about, and therefore tailor subsequent advertising. Pampers is able to show economy saving ads to those moms that clicked to read more about how to save money on diapers. Key takeaway: link retargeting in email marketing is a must! When your audience sees ads that directly relate to what they need, they’re more likely to make a purchase. Use link retargeting to ensure that your advertising dollars go toward qualified leads, not a larger audience that might not be very interested in your business right now. It’s no wonder some brands have achieved an ROI of 200 percent or more through retargeting. And when you use link retargeting to segment your email list in your email marketing campaigns, you have a good chance of improving your own ROI while keeping customers more engaged with your ads.